Metal Center News Directory of Toll Processors is a reference tool used to locate toll processors, companies that process other people's metal for a fee. This year's Directory includes 180 companies. They are listed alphabetically by region serviced, and there is also a Company Chart of services offered. 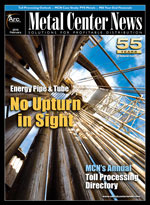 This Directory is published in the February issue of Metal Center News. This directory will not be posted on the website, but you can purchase a print or digital version of the February issue of Metal Center News. To be include in the next issue of this directory, print out and complete the Toll Processors' Survey and return via email to info@metalcenternews.com or Fax: 630-572-0689.